I graduated in 2009, after spending four years at a pretty chaotic university in Scotland. At the time, I was glad to escape and happy to get away from the university’s inability to return essays on time, their refusal to listen to student feedback, and most importantly, their desire to shut down the drama department of which I was a student. A department which had, at one point, been one of the leading drama departments in the country, and had helped the university gain conservatoire status. But that’s another story. Since I graduated, I’ve achieved a lot; my writing has improved, I’ve written for a number of publications, I’ve worked as an editor, I’ve got a good ‘day job’, I’ve bought a flat, and I’m paying off my student loan. But I am struggling to get regular paid journalism work, and I can’t afford to take time off my ‘day job’ in order to take unpaid ‘editorial work experience’ that sees me making coffee, doing menial tasks, or worse, being ignored. 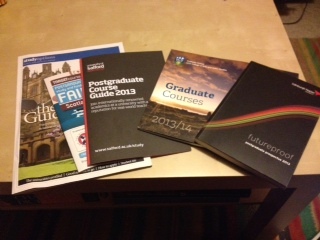 Since last year, I have been considering going back to university to do a postgraduate course in journalism. I know many people who have, and all of them are doing well; they work for big publications, they are establishing themselves in their field, and some of them are even moving abroad to further their careers. For me, I’m now at the point in my career where I have to make this decision; at the moment, I am still doing a lot of unpaid work, and I have a strong portfolio, yet when I have applied for journalism jobs, I have never even managed to get feedback on my application, let alone secure an interview. I suspect this is because my degree is, to all intents and purposes, a drama degree, although I specialised in arts journalism in my final two years, I feel that potential employers are looking at the words ‘BA (Hons) Drama and Theatre Arts’ and throwing my CV in the bin. My lack of journalism qualifications is counting against me, despite my experience in the industry, but it’s time to face facts, I need to have a journalism qualification in order to progress. However, postgraduate degrees, lest we forget, are expensive in the UK, disproportionately so, compared to fees in Europe and the system seems to be tailored towards attracting international students, as opposed to teaching domestic ones. Support for postgraduates is also low, and a recent report has revealed that 1,000 postgraduate students turn down places at Oxford University each year, because of the ‘financial demands of study there’. It’s ridiculous how expensive it is to study in the UK; some universities will change £6,000+ for a journalism postgrad, while others will charge more than £9,000 – and that’s just for fees, if you factor in basic living expenses, such as food and rent, then the average postgrad student is paying a lot of money for the privilege of further education. So, last week, instead of doing my usual and just thinking about doing a postgrad, I made a decision. I went to a postgraduate fair organised by Target Courses at the University of Edinburgh, to see what I could do, and spoke to various people about my options, both financial and otherwise. To my surprise, the whole afternoon was very positive. The representative I spoke to from SAAS (Student Awards Agency for Scotland) which handles fees and loans, was very helpful, and while they can only offer loans towards part of the cost of postgraduate degrees, they took me through the specifics of the loan and explained everything clearly. I also spoke to a number of university representatives, including those from Napier, Glasgow Caledonian, University of Salford, Manchester, UCD College of Arts and Celtic Studies, Study Options, Strathclyde University and the Fulbright Commission. Some of these conversations were very helpful, very positive and friendly, whereas others, weren’t. Just a quick heads up to anyone representing a university at a fair – answering questions with “Well, if you go to our website…” isn’t helpful, it’s lazy. I’ve spent time researching your courses, I’ve spent countless hours on many university websites – which aren’t always easy to navigate – and I’ve come with a list of questions, so the very least you can do is be prepared. Although, I had to laugh when I approached the ‘Study in Germany’ stand, just out of curiosity, because I didn’t know if it was an English-language college they were representing, and asked about their courses. The woman manning the stall paused, blinked slowly, and answered, “Are you German?” Whether she meant to say, “Do you speak German?”, I’ll never know, because the conversation quickly descended into farce from there, as she told me several times that I would need to speak German in order to study in Germany, gave me a website address, and sent me on my way with the most patronising of smiles. So, it wasn’t an English language college, then. The people who were willing to talk to me, and had answers to my questions made me feel like going back to university is something I can do; of course, I’m still trying to figure out which universities, which courses, and most importantly, how I will pay the fees, but it doesn’t feel like an impossible task any more. Yes, the fees are too much, we shouldn’t have to pay in order to better ourselves through education, and further education shouldn’t be a luxury for the rich and the well-connected, but I’ll be damned if I’ll let that stop me. Have you done a journalism postgrad? Are you thinking about it? Or are you determined to do it, like me? Got any advice? Get in touch, let’s talk.